Meet Smudge. He is, well, a smudge. And he is grumpy. Very grumpy. And yet, like some grumpy people, his friends still like him. All Smudge wants to do is go on a secret errand alone without any interruptions. (Hey, Smudge, you and me both, big guy!) But his friends want to know more. And they follow him. And they ask questions. And they ask more questions. Until finally, poor little Smudge is just about ready to burst. 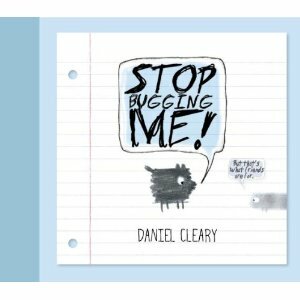 Little readers everywhere will love Daniel Cleary’s “Stop Bugging Me” and parents might actually recognize some of themselves is dear ole Smudge. As Smudge’s friends, one by one, follow along on their curmudgeonly friends’ errand, you won’t be able to hold your giggles in – nor will you be able to resist these adorable smudgy drawings. For anyone who has had their own moments of Smudge-ness, you are not alone. Although you might like to be.